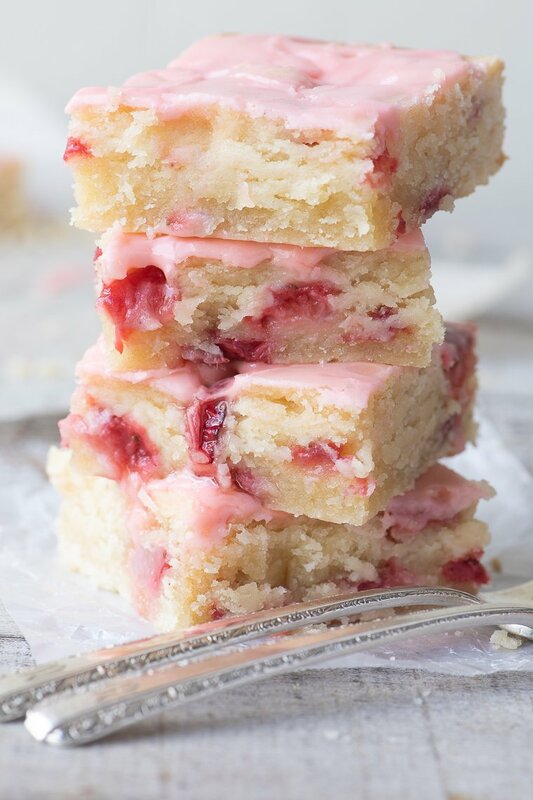 Strawberry Lemon Blondies ~ these easy strawberry blondies are moist and dense, (think soft shortbread) with plenty of little jammy pockets thanks to a cup of diced fresh strawberries in the batter. 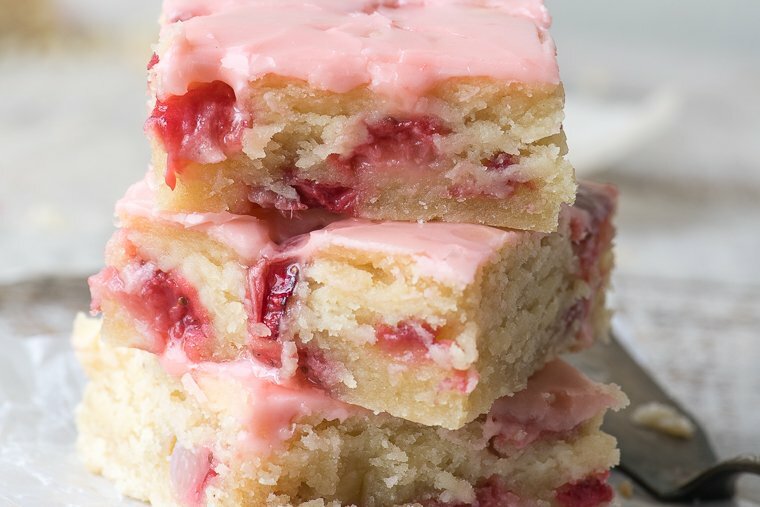 The hint of lemon revs up the berry flavor and gives these strawberry bars a bright, tangy vibe. 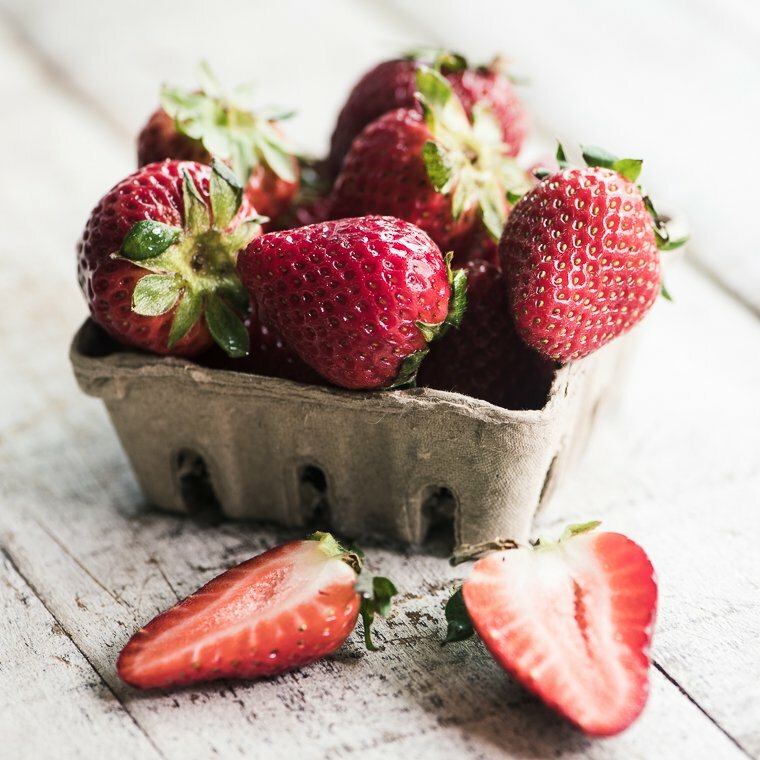 TIP: baking softens, sweetens, and brings out the best in pre-season berries, so before the really good strawberries start showing up at market, you can make fabulous strawberry desserts. If you like your desserts soft and moist, I know these will appeal to you. There’s nothing dry or crumbly about them, they melt in the mouth like a great blondie should. Only instead of nuts and chocolate you’ve got juicy strawberries and tart lemon. Wow. The plush batter is thick and easy to work with. Spread it out evenly in your pan so it bakes up nice and flat. This is one dessert that is more than meets the eye. It’s all about that party in your mouth! When it comes to small bakes like brownies and blondies, I like to bake in ceramic or stoneware. I think it bakes evenly without over cooking the edges. They come in so many pretty colors, but I’m partial to my white pan. Every kitchen needs one. I recommend the 9″ size, and look for something with weight to it, like this Le Creuset example. The side handles help when you’re trying to get it in and out of a hot oven. 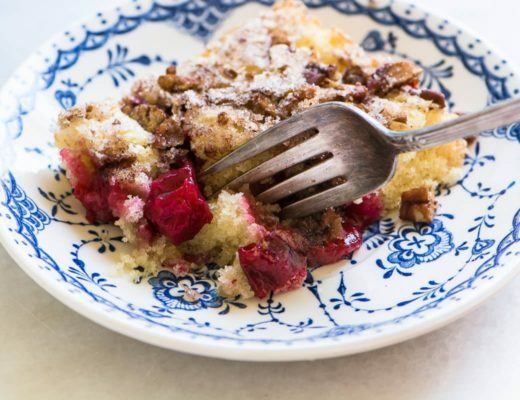 Try this with diced rhubarb, or a combination of strawberries and rhubarb. Or how about blueberries or raspberries. If you don’t want to bother with the strawberry puree for the icing, just use lemon juice. I took a pan of these to work and they were a big hit! You made a bunch of hungry nurses very happy. Thank you! Oh my goodness, these are phenomenal! I did have to use bottled lemon juice, but they are delish anyway. Thanks for sharing, this will be a regular. Thinking of adding a little cream cheese to the frosting.. good or bad idea? Honestly I wouldn’t, Brenda. I don’t think it will add anything and I imagine it would be hard to get it smooth. I used a glaze, not a frosting, but if you wanted to you could make a cream cheese frosting and use that. I think it might be overpowering for the blondies, though. Made these today and they came out great. Not quite as pretty as yours, the frosting was a little thin. But super delicious; lemon-y and sweet. I love your recipes and make them often. Thanks Suzie ~ and remember you can always thicken a glaze with a little more powdered sugar to get it just the way you want. If you use a different fruit, say rhubarb or strawberry and rhubarb would you still use the lemon? Yes, I would still use it, so it would be a strawberry lemon blondie, or a blueberry lemon blondie. The only exception might be the rhubarb. I still plan on making these for Easter but I froze my fresh strawberries. Question… Can these be made with frozen strawberries? Or will they come out too soggy? I personally wouldn’t recommend it Darlene, and it’s pretty easy to find fresh strawberries at most big markets these days, you only need a small-ish amount. I plan on making these for Easter. I will let you know how they turn out! They look and sound scrumptious! I’m not sure where I screwed this up but it didn’t turn out very well. I’m sorry but it was bland and tasted just ok. I WOULD LIKE THIS RECIPE, DON’T HAVE A PRINTER..NEED TO SAVE ON MY PAGE, IF YOU HAD IT TO SHARE i CAN SAVE IT….PLEASE PUT IT TO SHARE..
Donna if you click on the Print button to the right of the recipe, it will come up in text form, and you can copy and paste that where it’s convenient for you. Let me know if you still have trouble. Can something be sub in placed of the Lemon juice? More like a strawberry bar, no lemon. 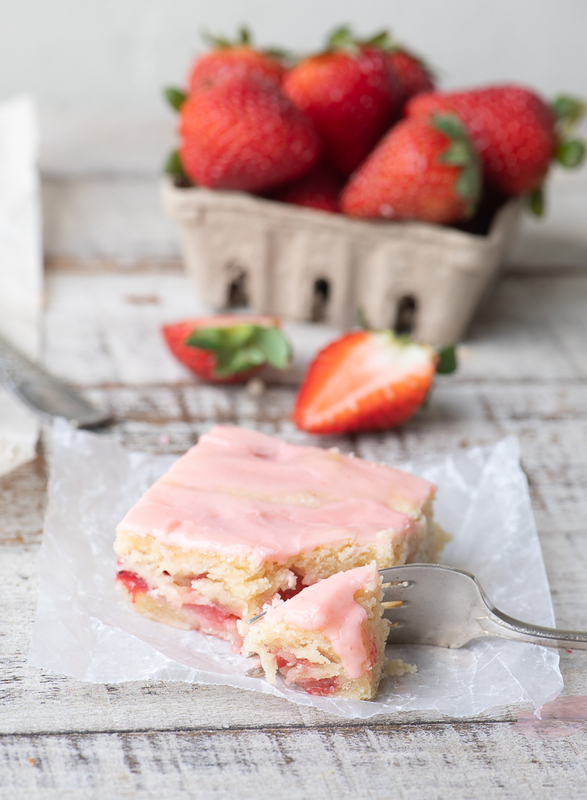 You might try milk in the blondie batter, and just use more strawberry puree in the icing. 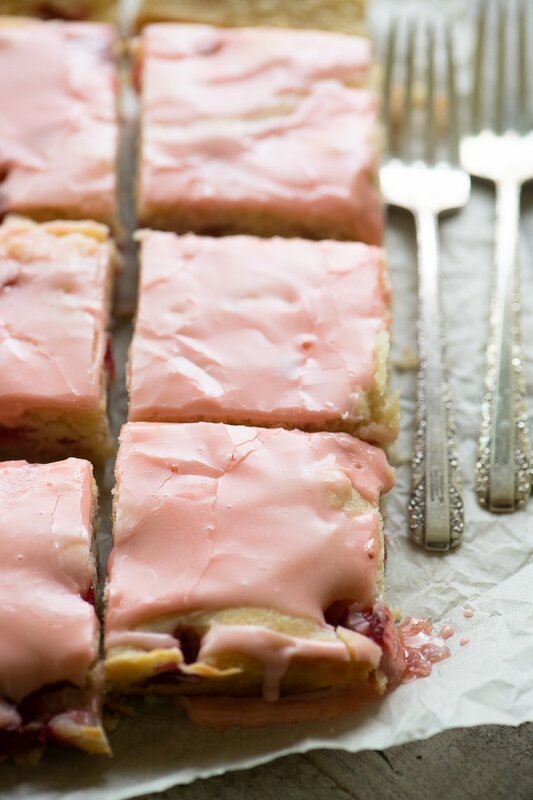 Making these tonight for a baby shower – the pink is perfect since the baby girl has already arrived! Thanks again for another inspiring recipe! I was thinking about that too! can i make this as cupcakes ? I don’t think these would make good cupcakes Ellie, but I have to say, I’ve never tried to bake a blondie batter in a cupcake mold. I think it would be the wrong texture, and it wouldn’t bake properly. Sorry! There’s a Print button to the right of the recipe, Shay! What about turning this recipe ketogenic? Can I make the glaze without lemon juice? Yes, sure. You’ll need a little more strawberry juice or puree. Can I grease pan with butter instead of using parchment paper. Also would you refrigerate or leave room temp after u bake them? Hey Teri ~ it’s a method of measuring flour to get an accurate amount. You first fluff up the flour in the bag or canister, and then scoop it up with your measuring cup. Then gently level it off. This just helps to get a reliable amount of flour. You have gained a few fans! Made this for our Sunday night family gathering and everyone kept going back for more. I cut them into smaller pieces so everyone felt less guilty splurging :) thanks for the tip of not over baking, mine baked for 32 min. Might even make for Easter- Thank you for a very yummy recipe. Of course we ate it before I thought to take a picture. I am so excited to give these a try Sue! They look wickedly irresistible! So perfect for spring and summer parties! I would like to make for a church meeting. Can the recipe be doubled and made in a 9×13 pan? Since I’m a vanilla lover, I’m planning to add a teaspoon of vanilla to this recipe. Can’t wait to try it! Thanks! How do you suggest storing these, Sue, and for how long? Counter or refrigerator, bringing chilled bars to room temp before serving? Thanks, these look perfect for spring and the next time I have to bring dessert to a meeting—like next Sunday! Could I make them on Friday, for example? I stored mine on the counter, loosely covered with foil. I don’t recommend making these too early before you need them, they just won’t be as good. You can make them in the morning for Sunday night, but I wouldn’t make them a day or two before. That’s just my personal preference. If you do make them a day ahead keep them un-cut and loosely covered with foil after they’ve completely cooled. Darn, I’m away part of the weekend so will have to wait to try these; can only make them Sat. morning. 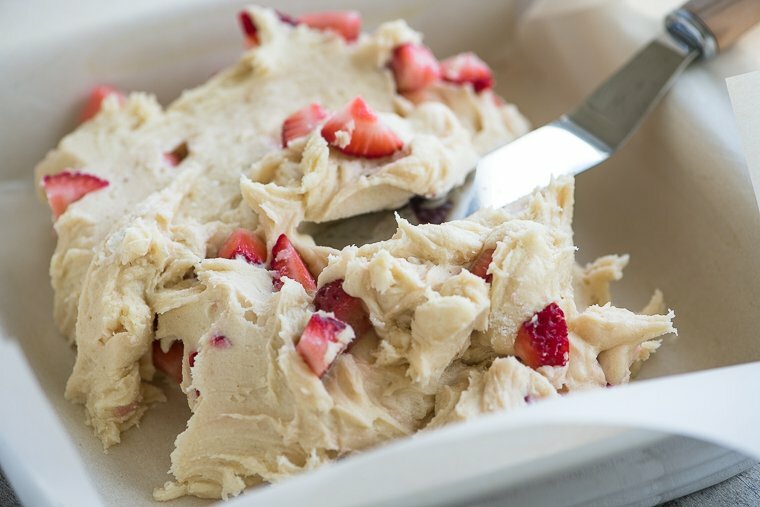 I know your recipe calls for fresh strawberries but I have a freezer full of strawberries from last season’s sales ! So here goes ! Are frozen strawberries another option? You can try them, but your blondies might be a little moister than mine. Definitely don’t use more than a cup of diced berries, and ideally you shouldn’t defrost them completely before using. So you’ll have to do a little slicing and dicing on the cold berries to make it work. White chocolate with this delicious looking dish sounds YUM!! Can hardly wait to try it on my friends that come here every Sunday after church for brunch. Yeah! Reading this post I realized something: Your writing is just so good. The attractive and colorful photogrraphy and of course the always creative and tempting recipes are why I first started here, but the writing keeps me here just as much the the overall look and the goodness of the recipes. Thanks for making my day Judy :) The writing in blog posts is such a hotly contested issue, some believe it should be as brief as possible. I try to be brief, but still make it fun to read. I’d actually love to write longer form posts…but they say everything is going to be video soon, so, why bother?? Oh Sue!! These look so scrumptious!! Perfect timing! I’ve been looking for something like this for Easter! Thanks girlie! Do you think they would freeze well; frost after thawing out?? I have a busy week, and it would be great to make the cake part in advance. I haven’t frozen them so I can’t say for sure. I kind of think they might get a bit soggy due to the berries, but not certain. What I would do is get everything measured and set out on the counter the night before so you can throw them together in a flash. It’s not a very complicated recipe, in fact the little bit of puree for the glaze is the fussiest part and you could do that in advance. Is there a gluten free option? These sounds delicious! I bet it would be great with almond and coconut flours? Sue, you have outdone yourself this time. 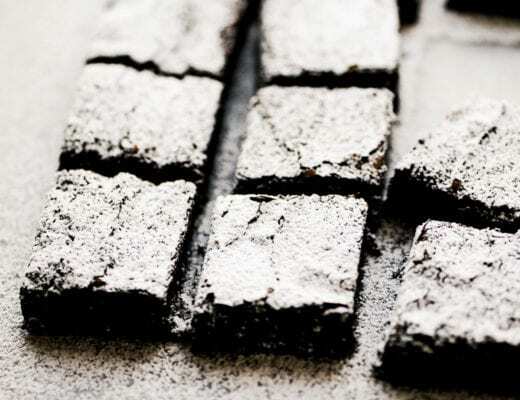 These are the most beautiful things, and I’ll make some this weekend. Wow! These blondes are so pretty!! 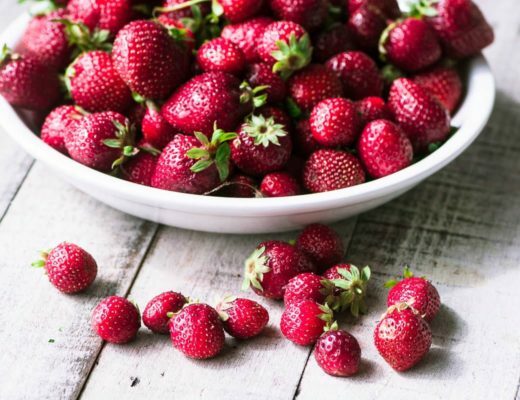 Love strawberries and can’t wait to try this recipe Sue! Thanks for sharing! 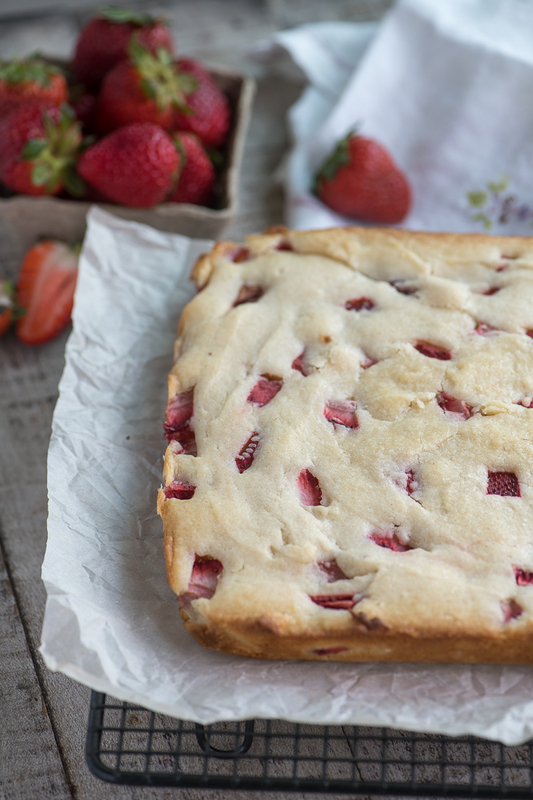 It’s an easy way to jump into strawberry season, nothing fancy, but they hit the spot! Could you use cake flour with these? I can’t wait to try them. They look amazing. 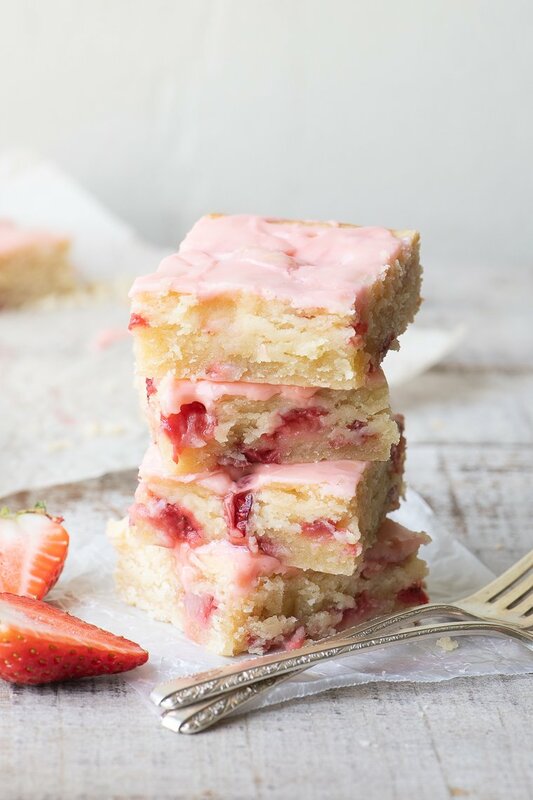 Oh my, I make lemon blondies but never thought to add strawberries! So pretty and springlike and no doubt delicious. Pinned! What pretty pinky colour! What makes a blondie a blondie? I used to think it involved white chocolate, but I guess that’s not the case. 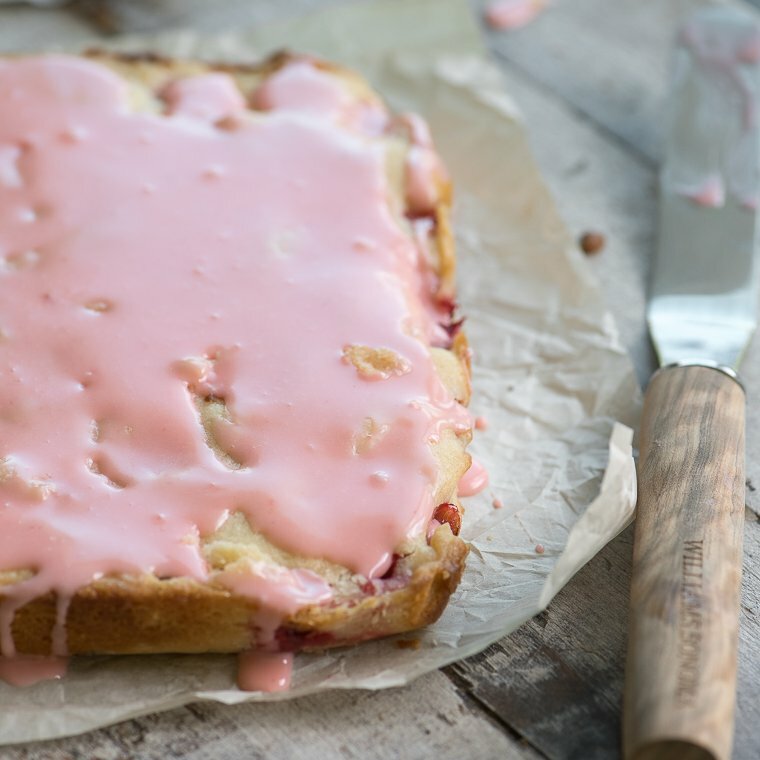 Love these pretty pinky spring desserts. I guess I go by my own rules in the kitchen Angie ;) I don’t know if blondies have to have white chocolate, but come to think about it, a little white chocolate wouldn’t be too bad in these!